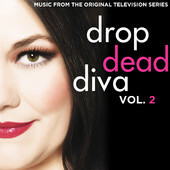 Madison Gate Records will release Drop Dead Diva: Music From The Original Television Series, Vol. 2 on September 4, 2012 exclusively on iTunes. The digital only EP features a selection of hand-picked and fan-favorite tracks from seasons 3 and 4 of the Sony Pictures Television dramedy, an original recording by “Drop Dead Diva” series regular Margaret Cho and is available for download only days before the highly anticipated fourth season finale of “Drop Dead Diva” on Sunday, Sept. 9 at 9pm on Lifetime. Additional artists featured on the 9-track compilation includes Sugar & The Hi Lows, The Parlour Suite, Katie Herzig, Amy Stroup, Andrew Bell and Andy Davis. This is the second “Drop Dead Diva” musical release from Madison Gate Records. The first album was released in 2010 and features a selection of songs from seasons 1 and 2 of the series. Drop Dead Diva: Music From The Original Television Series, Vol. 2 is available now for pre-order on the iTunes store: http://itunes.apple.com/us/preorder/drop-dead-diva-music-from/id555516755.